Eleven foot eight dot com is an oddly specific domain with a correspondingly niche focus: the website revolves entirely around footage of a particular train bridge in North Carolina. This bridge has been nicknamed “the can opener” for its uncanny ability to regularly scrape the tops off of oncoming trucks. It has been involved in hundreds of accidents over recent years, despite what appear to be ample warning systems. Located in Durham, the bridge was completed in 1940 and simply not designed to accommodate trucks above a certain height. Area resident Jürgen Henn noticed the high frequency of collisions and in 2008 decided to install a camera on a nearby building to document them. Since then, he has captured, edited and posted over 100 videos of collisions, mostly of amateur drivers in rental trucks or RVs. The state, railroad and city have all considered or taken actions to reduce accidents involving the bridge. From the perspective of each party, the problem is as well-solved as it can be. The state has prominently posted a pair of signs, flanking the street, that indicate the height limit of 11′ 8″ (a few inches less than the actual clearance). Clearly, though, these do little to prevent accidents. By installing a crash beam to keep trucks from hitting the bridge itself, the railroad protects its infrastructure, freight and passengers. Their concern is not with trucks on the road but trains on the rails above. The city has installed a supplemental array of warning mechanisms, including three “Low Clearance” signs posted at each of three intersections in advance of the bridge. Until recently, an “Overheight When Flashing” sign (with blinking orange lights) was also posted directly in front of the bridge. Trucks, however, continued to crash into the beam, so the sign was removed and a new strategy implemented. An LED display was swapped in for the old combination of sign and lights. This display activates when attached sensors detect an oversize vehicle approaching. The sign sits alongside a new stoplight that is likewise tied into the sensor system. The light turns red to give truck drivers time to see the warning sign and consider their options. Despite even this latest sophisticated intervention, however, the bridge continues to claim and maim trucks. Since no amount of warnings seems sufficient, other solutions have been considered and rejected, including: raising the bridge, lowering the street or redirecting truck traffic entirely. Unfortunately, raising the bridge would require a lot of money and regrading on both sides. Lowering the street is impractical because a sewer main runs below. Redirecting overheight traffic from the area entirely would be impractical, since many trucks need to approach the intersection then turn on the street running parallel to (but just before) the bridge. In a way, the bridge represents a perfect storm of variables conspiring against a complete and permanent design solution. The railroad, state and city have all done what they can and called it a day. What remains is a flawed piece of infrastructure that exists in a sort of bureaucratic void. It seems to be waiting for either an extreme event or someone to come along with an ingenious alternative solution. Meanwhile, 11foot8 continues to dutifully document the bridge, which, like numerous other too-low overpasses around the world, seems unlikely to stop causing accidents anytime soon. The wording of that message is horrible. “Overheight must turn”? That makes no sense at first glance. How about “You will hit this bridge!” instead? I wonder if putting a breakaway panel under the bridge, bringing the visible height to something like 10′, would be useful. 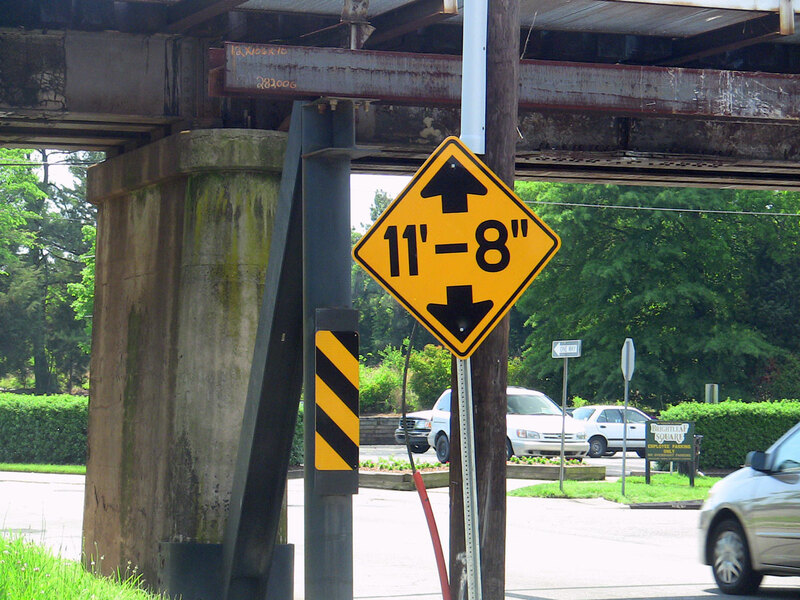 If there aren’t a lot of vehicles between 10′ and 11’8″ that presently go safely under the bridge, making the clearance less might mean there are fewer vehicles that don’t quite fit. And a non-structural piece at the bottom would mean that the vehicles that look like they might fit but don’t would be damaged less than the (different) vehicles that currently hit it. Alternatively, a sign hanging down to 11’8″ on chains at the edge of the intersection might help; something smacking into your vehicle before you reach the actual bridge tends to get your attention a useful portion of the time. Local buses are 11’6″ high. There is a bridge just like this by my mom’s house on Marsh Rd. in Pittsford, NY, a suburb of Rochester. At least several times per year there is a truck lodged underneath the RR bridge. They don’t seem to be trying all the crazy signage though! I think they should put low hanging ropes shortly before the bridge which would alert the drivers who have trucks that are too tall. it would be like an airborne bumble strip. It would resemble a curtain made of climbing ropes. This is the bridge in the final video. Just down the street from my work here in Melbourne, Australia. You can see the gantry erected to warn drivers, but alas the last 2 collisions in the history section of that site have occurred AFTER the giant flashing gantry was installed. Also, I think this website URL is wonderfully complete. I think they should add a loud horn that plays when the sensor picks up an oncoming vehicle. Something to get the drivers attention and make them stop (Obviously attempt to get the horn to stop playing when the large vehicle stops, so as not to be too much of a nuisance). They can’t make the street lower? Why not drop the street a foot? The article has the answer: There is a sewer main under the street. 1. The signs are always a lie, the posted is significantly shorter than the actual in 99% of locations… often in punitive, “We’re not even going to base this on reality” ways. There’s an old railway underpass in Edgewood, PA labeled 9 foot 0 that I took my 10 foot 6 truck through almost daily; the alternative was a 20 minute drive around in traffic. 2. Someone driving a truck has to get to the other side somehow, often on a schedule. The signs are a classic case of crying wolf so the result is that they try it anyway knowing that 99% of the time if their truck is even in the ballpark they’ll probably fit. If the various jurisdictions just labeled them what they actually were you’d get the people that are actually paying attention to at least slow down and look as they try to pass under…. the rental truck and motorhome crowd doesn’t even know they need to think about their height so no manner of signage is going to change anything with them.